I awoke to a dark and stormy sky. A light drizzle drummed softly on the roof as I peered out the windows considering the chances of catching the morning light for sunrise. “Minimal,” I thought. I knew with absolute certainty I needed rest before another long day shooting on Maui. But sometimes, even the smallest opportunity for success is enough. 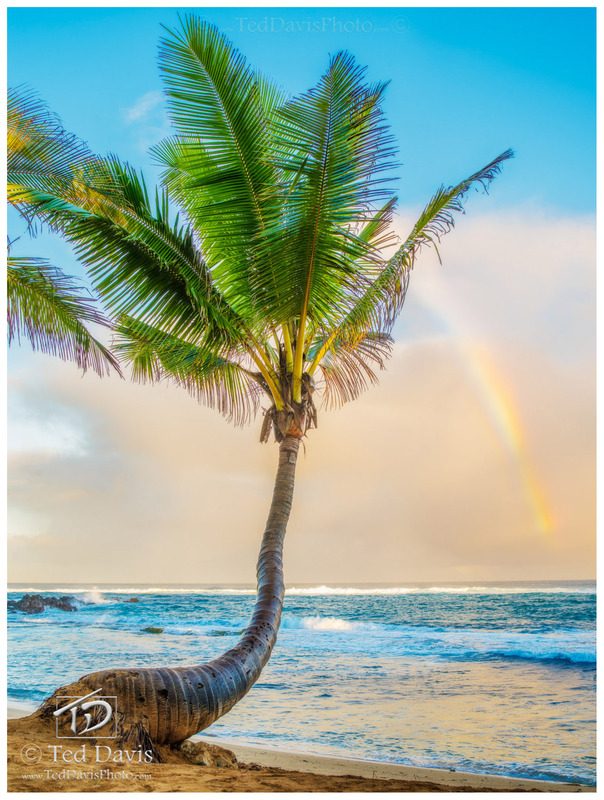 Rolling out of bed, I gathered my gear and began my drive to Mama’s Fish House – a 45 minute stretch through old sugar cane fields, for the slightest opportunity I might see some light among the shore palms. Perched on the beach at Mama’s as the drizzle finally let up, I noticed the sky to the north began to clear as the sun began to rise. Within minutes, blue sky burst through the cloud cover as the early sunlight beat back the storm. Moments later, as I was framing a different shot, a magnificent rainbow appeared on the horizon. It was a perfect moment on Maui. Adjusted my composition, I captured a beautiful image – a reward for my perseverance. Photo © copyright by Ted Davis.